45 square meters, on the ground floor of the house. (+ one B & B on the top). 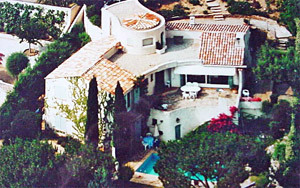 The house is built in the " Super Lavandou " on 1 239 square meters, fenced, in a calm residential neighbourhood. Even from the garden, you can see a beautiful view of the sea and the islands and only a fifteen minute walk on a pedestrian street from the beach and downtown. Living room with an elevated bed. Small room (2.30 * 2.10 meters ) with single bed. This room has access to the kitchen and the bathroom. Independant kitchen : refrigerator/freezer, dish - washer, induction hob, oven, microwave oven and all necessary dishes. Price by week: 540 € / 1200 €.